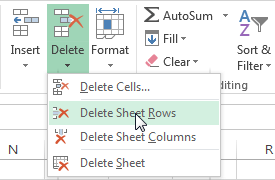 Excel allows you to delete rows and columns which you don’t want to be present inside the worksheet. You can delete them by using one of the two different methods. I will show you how to do it in the following example. First, delete rows: 3 and 4. 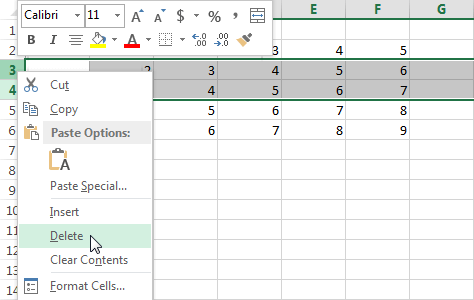 Select cells E3 and E4 (or other that are inside row 3 and 4), then go to HOME >> Cells >> Delete >> Delete Sheet Rows. Rows 3 and 4 have been deleted. To use the second method, select those two rows by clicking and dragging their numbers, then use right-click and select Delete. You can delete columns in a similar way.